Today Facebook Messenger has added a sorely missing feature - quoted replies. 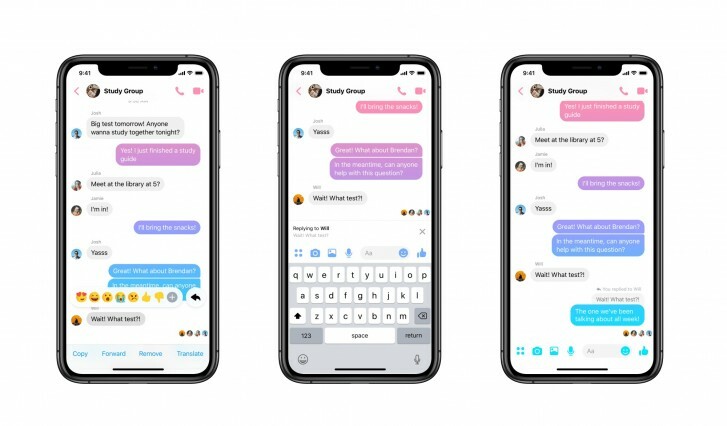 This allows you to reply to a specific message in a conversation, and is incredibly helpful when you're engaged in chats that have a big range of topics. Using the new feature, the people you're talking to will now know exactly what you were replying to with that "LOL", for example. This has been a feature in WhatsApp, which is also owned by Facebook, for a very long time, and it's always been sort of a baffling omission in Messenger. So it's good to finally see it there too. In order to quote a specific message, long tap on it and you'll see a new Reply button to the right of the reaction emojis. Tap that, write your reply, and, just like in WhatsApp, the message you're replying to will appear above your reply. Easy. This potentially means you'll have less misunderstandings with your friends as to which message was referencing what. The feature is rolling out now on both iOS and Android. This feature has been around for a long time now. You just need to slide right on the message you want to quote and then you type. It's actually faster that way..